Why does the 2013 Honda CR-V crossover continue to remain near the top of the list for many Middletown and Newburgh drivers and their families? Signature Honda dependability goes hand in hand with a spacious cabin, lots of cargo space, and high performance. A sleek, streamlined design means it’s not bad to look at either. The 2013 Mazda CX-5 is another similarly sized crossover to the current CR-V that drivers may also be considering. To help you make up your mind, let’s take a closerlook at the two CUV options. 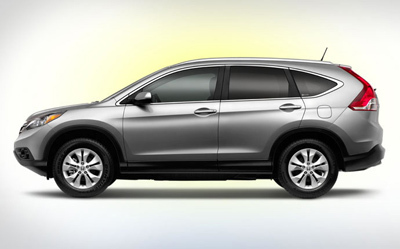 The 2013 CR-V LX, the base trim, comes equipped with an Inline four-cylinder 2.4 L engine. This gives it a power output of 185 hp and 163 lb-ft or torque. This is compared with the 155 hp and 150 lb-ft offer on the base, CX-5 Sport model with the 2.0L 4-cylinder engine. Clearly, power lies in the owner of the Honda. The CR-V also has a much greater cargo capacity. It has a base capacity of 37.2 cubic feet, and 70.9 cubic feet with the seats down. This is compared with the 34.1 and 64.8 cubic feet on the CX-5, respectively. What increases the CR-V’s appeal is its great list of features. It has plenty of great standard options that do not come standard on the 2013 CX-5. If you and your family are interested in a test drive, we invite you to stop by Middletown Honda. We’d be happy to show you the CR-V, as well as tell you about the different options available. Middletown Honda is located at 520 Route 211, a quick trip from Newburgh and other communities around Orange County. If you have any questions, please feel free to contact our sales team.